He claims it belongs to his dad, and that the color is in fact, Raspberry; but the reality of the situation is that Sam Lucas has a pink truck. I know this because I had the chance to ride in it the other day after Sam and I went on his first ever downwind run. My first downwind run EVER!! So, on my vacation back home I had one thing that I really wanted to do. 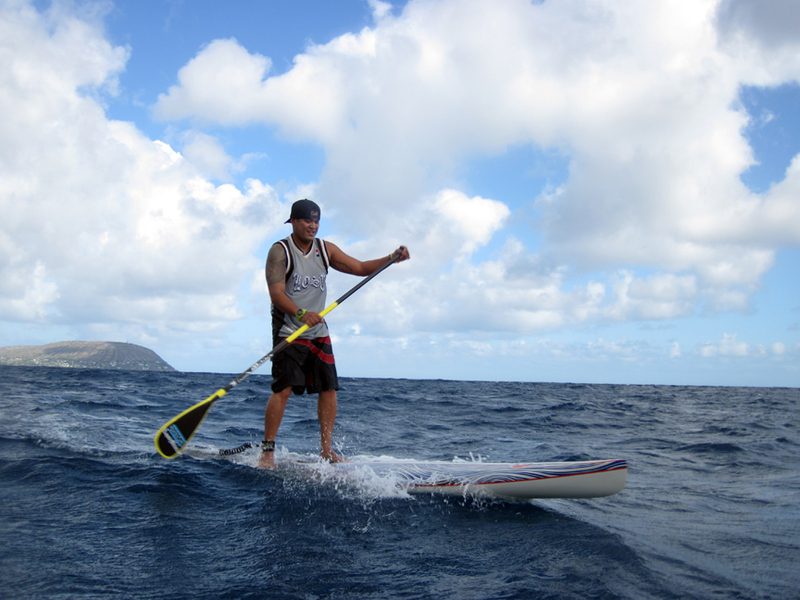 A real downwind run and one of the best ones around is on the island of Oahu. 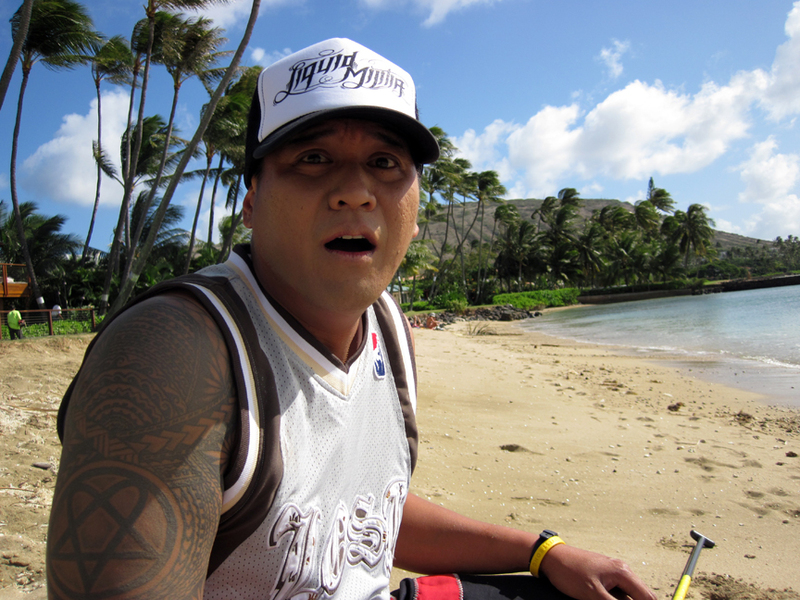 The super fun and never boring Hawaii Kai to Kaimana Beach run. I’ve done minor downwind runs in Santa Cruz that started from Natural Bridges to Capitola. Minor being winds up to 15 mph and nothing stronger. 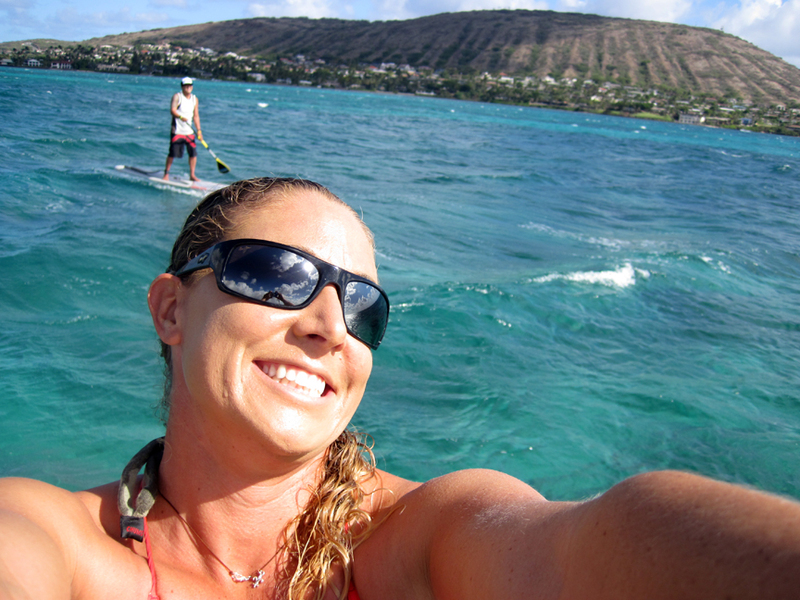 I get in touch with my famous sister, female paddle phenom, and all around water woman Morgan Hoesterey to ask if she can take me on the run (This will feed her ego, but I love her anyway). Of course the sweetheart that she is, she agrees to take me. 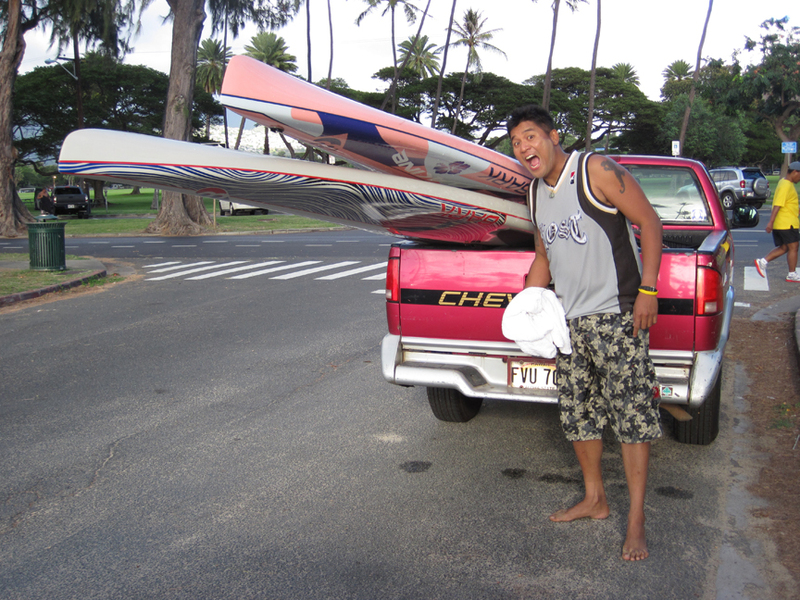 She even outfitted me with a really awesome 14ft Joe Bark downwind board to use. I was super stoked that she took time out of her busy life to take me out and show me how it’s done. As soon as I hit the water I can feel the wind pushing me out to sea. I start to freak out a little, trying my best to not let Morgan know. The great friend that she is, she tells me not to worry and that once we get out further the wind will bend and shoot us straight for Diamond Head. Of course there were major doubts in my head about what she said, but who am I to second guess her? She’s done this run a million times before! I’m still a little scared though. The fear of being blown out to sea was sitting in the back of my head. I start to paddle and try to catch some bumps. I’ve never done it before and I wanted to do it badly. I’ve seen all the videos and heard from everyone that catching bumps are super fun and you can glide forever when you know how to do it. I see Morgan catching some good bumps and gliding for a while. I wanted to get to know that feeling and was paddling my heart out to try and get one. I struggled until my famous sister coached me on the fly on how to catch them. She told me never paddle uphill and only paddle downhill (I had no idea what she meant at the time). Then it all made sense when she dummed it down for me LOL!! “Watch the nose of your board. When you see it drop, start paddling little bursts. When you miss it and you see the nose of your board point upwards. Don’t paddle and wait for it to drop again. Then start paddling again. If you miss one get ready to go again because another bump is right behind.” I see said the blind man LOL!!! I was having such a blast! Then it all came to an end when we rounded Diamond Head. It took us about 2 hours to finish that run. Even with me falling all over the place. She said that we made pretty good time, but I wanted more! 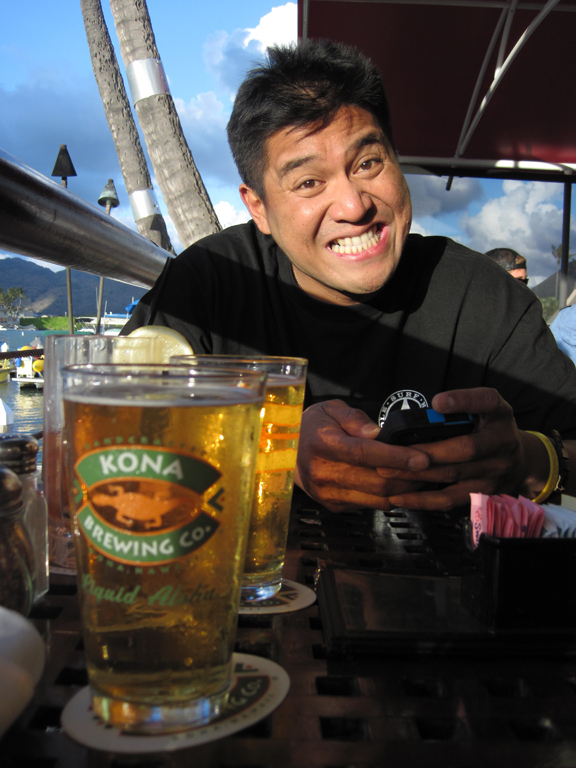 We had some snacks and grande cervesas at Kona Brewing Company at the end of the day. I made another date with her for the next day and invited my friend Shane to come with us too. The second day was really intimidating. The wind was howling with gusts up to 35 mph. I admit that I was a little more concerned than yesterday. We all got to the launch area and got ready. Shane was telling me that this was going to be a fun one. Morgan was saying the same thing to. As usual I just took what they said and put my trust with them, and we’re off! This time the wind was blowing me out to the open ocean from the get go. I was a little scared, but I had Morgan and Shane watching and waiting for me. I just let my guard down and started paddling. I remembered about what Morgan said yesterday about not paddling up hill and only paddle downhill. Although today was way windier than yesterday I had so much fun! As soon as we hit past the channel markers the wind was howling! I caught my first bump right away and was gliding for a while then the ride stopped. I was so excited about catching the first one I was paddling hard to catch the next one. I think I had caught a lot more bumps than yesterday and was definitely hooked on downwind runs! With the winds being higher than yesterday I fell off a whole lot more, but I was having tons more fun! I caught longer runners that felt like I was gliding forever until the inevitable dunkage towards the end of the ride LOL!!! It was a blast watching Shane and Morgan catch bumps with ease and gliding for a long time. I wanted to get more for myself, but catching and surfing bumps comes with experience. Being only my second time out there I still had a lot to learn. Being out there on the ocean with Morgan and Shane was priceless! Too bad that I had to leave back for California the next day. I would have made Morgan take me out again! It was super fun and would love to have anyone try it once. 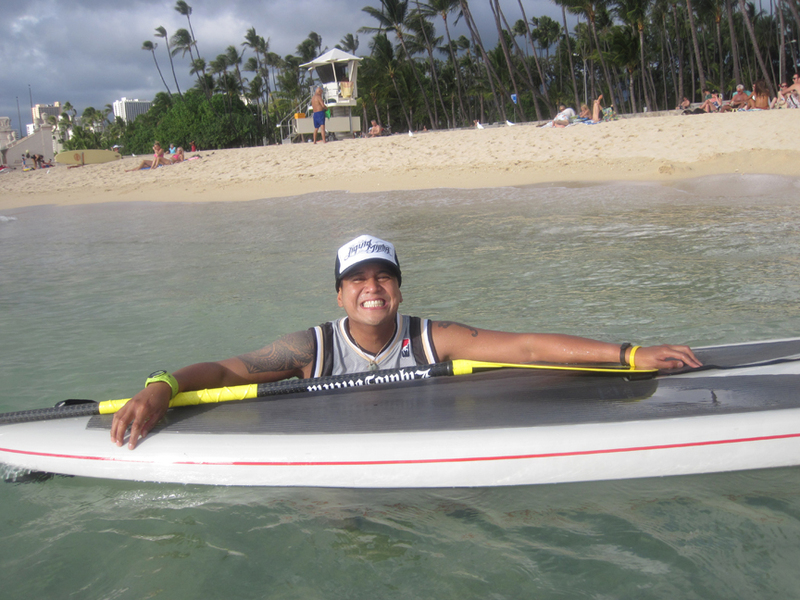 I found that downwind runs are a great escape from the crowded surf breaks. Thank you Joe Bark for making that awesome 14 downwind board that I used. It’s a great board and even an inexperienced downwind person like me could catch some with it! Thank you Morgan sister for taking me out and showing how to catch bumps! You got me hooked and I want to go again next time I come home!